My obsession with roasting vegetables continues! 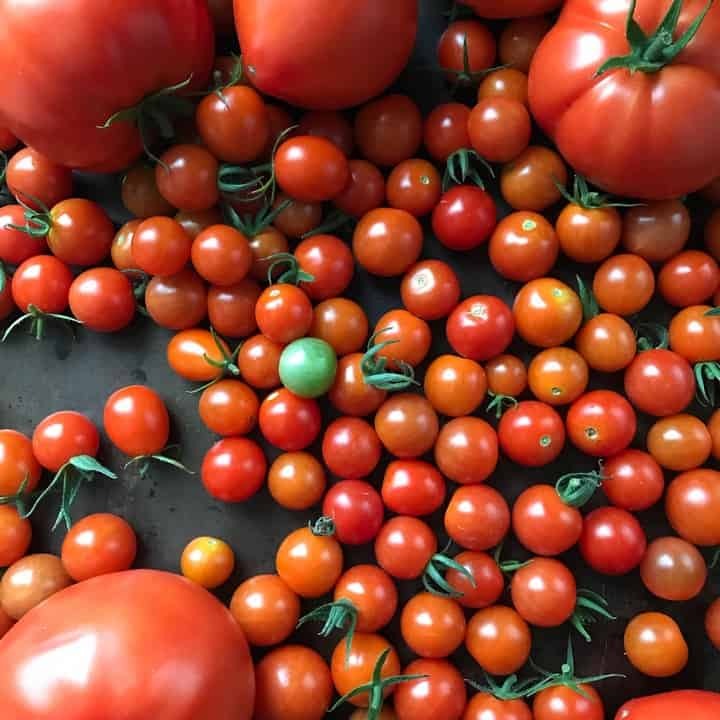 Technically considered a fruit, cherry tomatoes are one of the easiest plants to grow. If you have them growing in your backyard, you probably know that some varieties can actually produce hundreds of fruit. 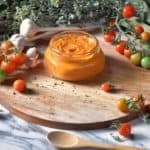 Although there is nothing better than enjoying that burst of raw fresh sweetness, there comes a time, usually towards the end of summer, where everyone is wondering what to do with an overabundance of cherry tomatoes. After all, there are only a certain amount that you can pop in your mouth! One of my favorite ways of preserving this fruit is this simple DIY method of oven dried cherry tomatoes. I already have a few kilos in my freezer. These will eventually find their way in this Fregola Salad -a favorite winter salad of mine! Another way I love to preserve cherry tomatoes is transforming them into a sauce. 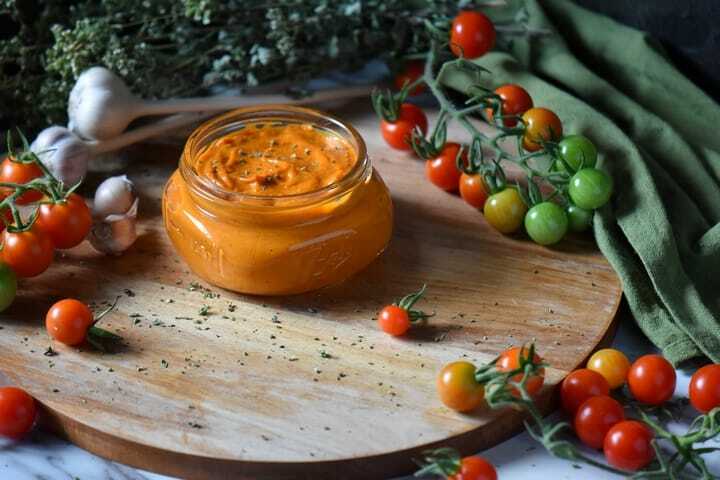 This simple and tasty cherry tomato sauce is the result of roasting a few simple ingredients together. Let me show you how it’s done! The first thing we need to do is to rinse a couple of pounds of cherry tomatoes. With a tea towel, gently pat them dry. Slice the cherry tomatoes in half and place them in a large mixing bowl. Add the chopped garlic, oregano and olive oil and toss together. Please note that you can use both fresh or dry oregano in this recipe. As a general rule of thumb, replace 1 tablespoon of fresh oregano with 1 teaspoon of dried oregano. Transfer to a parchment lined rimmed baking sheet and spread the herb and olive oil coated cherry tomatoes in an even layer. Make sure to get all of the liquid onto that baking pan. ProTip: The cherry tomatoes will release a lot of liquid, so make sure to extend the parchment paper over to the sides so that none of the cooking juices escape. Bake in the oven for about forty-five minutes or until the cherry tomatoes have softened and begin to caramelize. 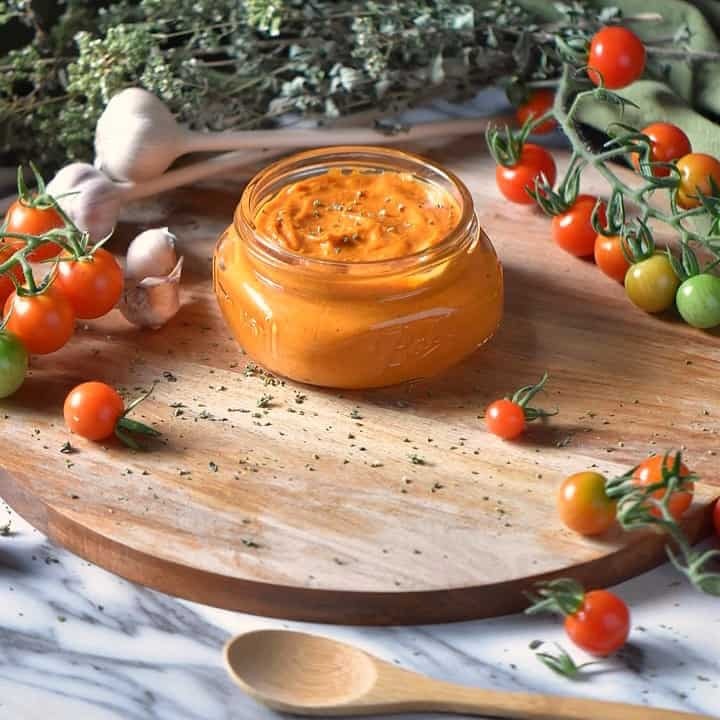 Once the cherry tomatoes have cooled down, transfer to a bowl and with an immersion blender, process until smooth or until the desired consistency is achieved. Congratulations! 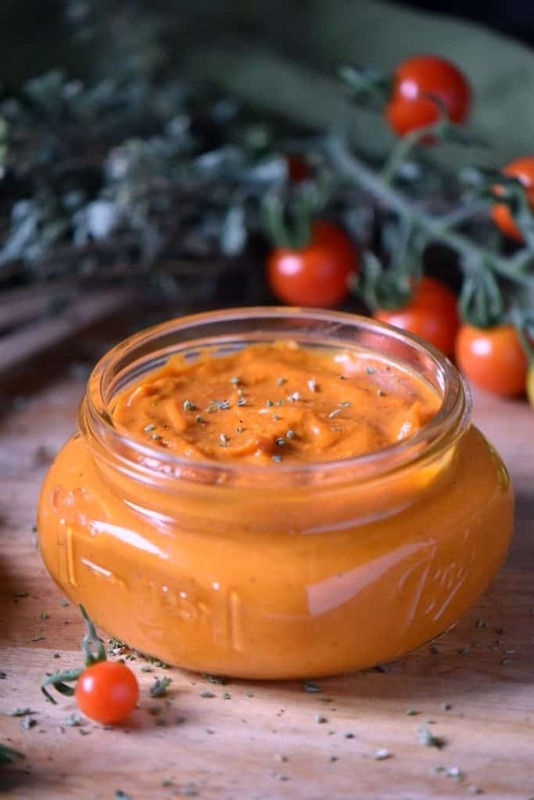 You have just made a flavorful and easy cherry tomato sauce. 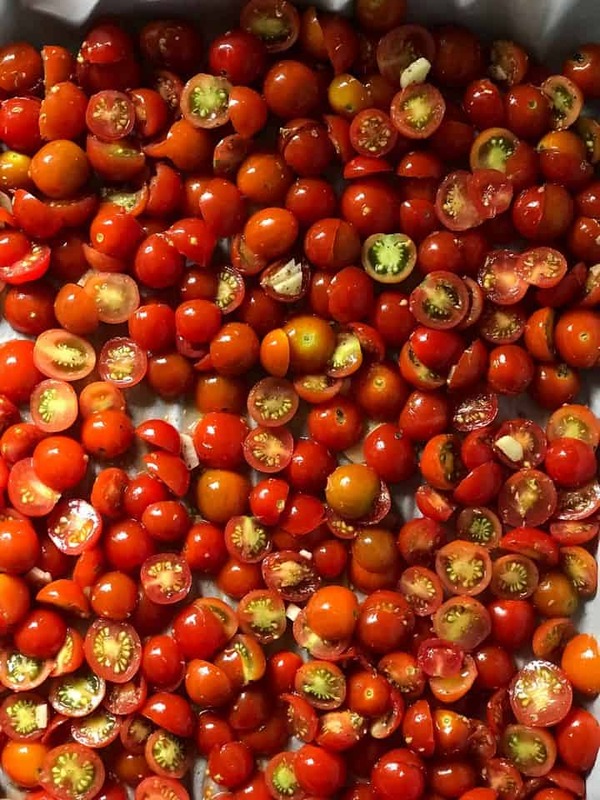 What to do with a smooth and silky roasted cherry tomato sauce? If you are wondering if you can freeze this sauce, the answer is yes. In fact, this sauce freezes really well. Roasting one kilo of cherry tomatoes (that’s approximately 2.2 pounds) will provide you with three cups of pureed tomato sauce. I divide the sauce using ice-cube trays. Once frozen, I will transfer the cubes in a freezer bag. They are great to use as flavor boosters in soups and stews. They can also be transformed into a quick tomato sauce to top off chicken. 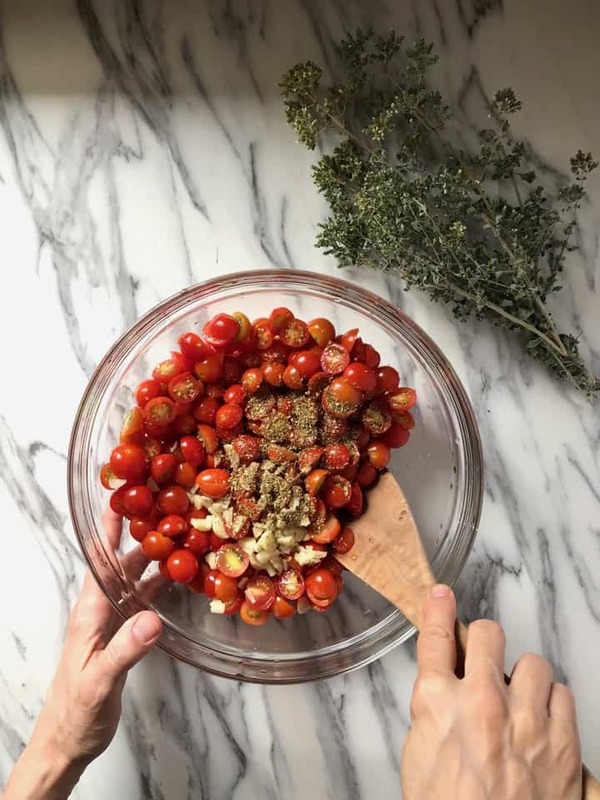 As an alternative to blenderizing the cherry tomatoes, you can leave the roasted cherry tomatoes as they are, and use a “chunky” version in pastas and salads. They are just as tasty especially if you drizzle a little balsamic vinegar over the top! If you need some cherry tomato inspiration, head on over to Emily’s Inside the Rustic Kitchen to get her recipe for Basil Pizza with Roasted Tomatoes. While you are there, make sure to check our her Cherry Tomato Foccacia! Ever since I can remember, roasted cherry tomatoes were always “a thing”. My mom would simply drizzle them with some olive oil and oven roast with a few herbs. These roasted cherry tomatoes would be served as a side dish, or tossed in a salad. Throughout my professional career as a dietitian, I was fortunate to work with so many colleagues that were so passionate about food. Needless to say, Monday morning conversations were mostly about what everyone did and especially what everyone ate on the weekend. Following the suggestion of one of my colleagues, who, by the way is one of the best cooks I know, I started using my immersion blender with my roasted cherry tomatoes… and as they say, the rest is history. Hope you get a chance to enjoy this wonderful recipe! 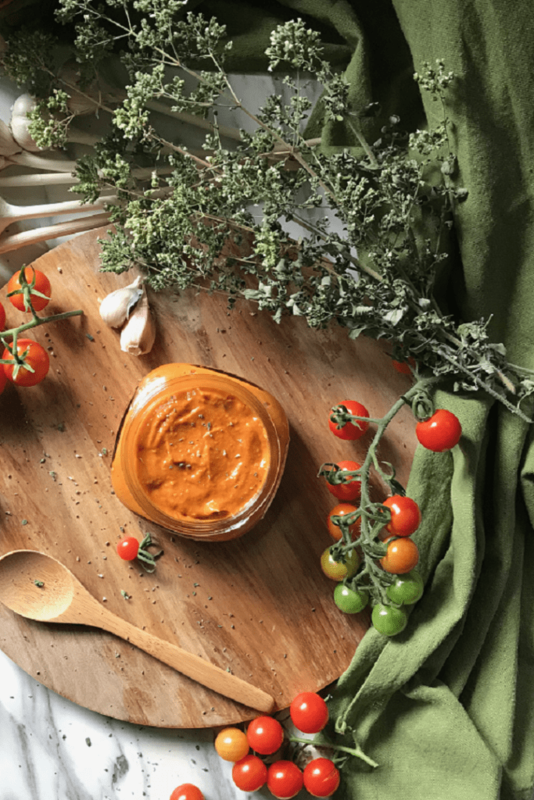 ★★★★★ If you have made this Roasted Cherry Tomato Sauce recipe, I would love to hear about it in the comments below and be sure to rate the recipe! 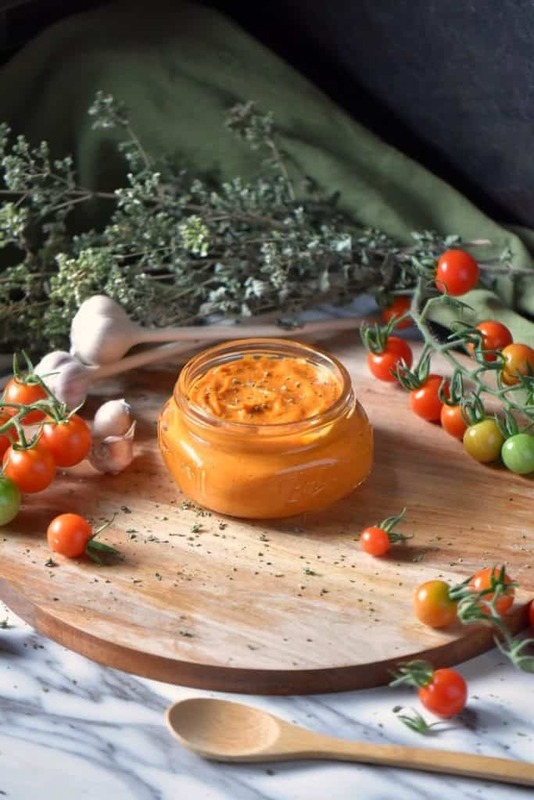 With only four ingredients, you can make this simple and tasty Roasted Cherry Tomato Sauce. What a wonderful way to preserve your bumper crop of cherry tomatoes! Rinse cherry tomatoes and pat dry with a tea towel. Slice cherry tomatoes in half and place in a large bowl. Add the minced garlic, oregano, olive oil and toss together. Add salt and pepper to taste. Transfer to a parchment lined rimmed baking sheet and spread cherry tomatoes in an even layer. Bake in the oven for about 45-60 minutes until they begin to soften and begin to caramelize. Can be used as is or use blender for a creamier version. Total Yield of recipe is 3 cups. A serving is calculated as 1/2 cup. IF YOU ENJOYED THIS CHERRY TOMATO SAUCE RECIPE, SAVE IT FOR LATER. 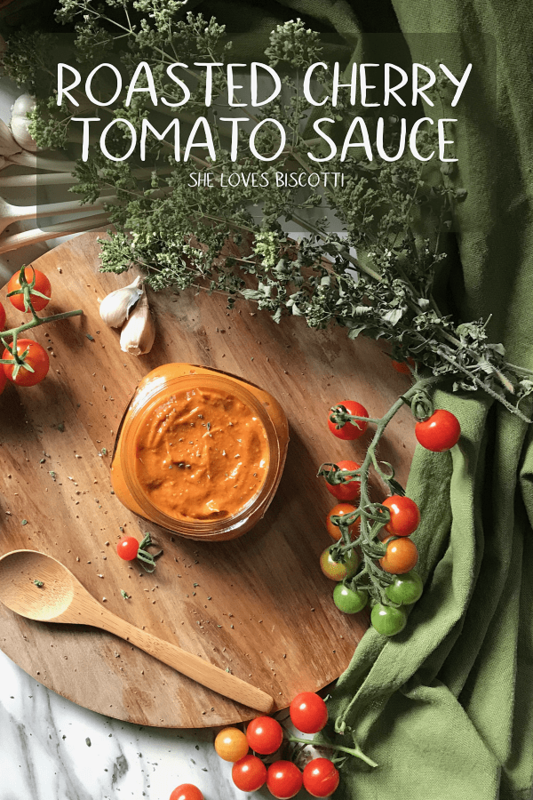 Your roast tomato sauce sounds perfect for when good off the vine tomatoes are no longer plentiful. I can always find sweet cherry tomatoes at our market. Well, that’s easy! And the smells emanating from your kitchen must be intoxicating! Garlic, oregano, olive oil and fresh tomatoes–what could be better? Thanks for posting! Another beautiful recipe that makes us enjoy the fruits of summer during the colder winter months. And what a great idea to freeze the sauce in the ice cube tray! Thanks for the inspiration, Maria! Absolutely love this idea, just in time for the last of the season. What a terrific way to have a memory of summer sunshine once the seasons change. That looks delicious enough to use as a simple spread for crackers!